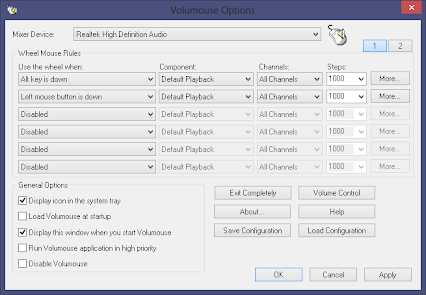 Volumouse is a free application to control Windows sound volume with mouse scroll wheel and hot key. Volumouse provides you a quick and easy way to customize the way you want to control the sound volume of any audio device, microphone volume, screen brightness, Window transparency, Send Hot keys. You can change volume simply by rolling the wheel of your wheel mouse and customize it with any other mouse button or hot key combinations. Volumouse allows you to define a set of rules for determining when the wheel will be used for changing the sound volume. You can configure Volumouse to use your mouse wheel for volume control when the Alt key is hold down, when the left mouse button is down, when the mouse cursor is over the Windows Taskbar, Title bar, Desktop, Windows media player, iTunes, VLC and so on. When the conditions that you define are not satisfied, your mouse wheel will be used for the regular scrolling tasks, exactly as before.